Traveling solo is like wandering, almost unplanned, and a wanderer is someone who sees life as it is. For the self confessed reluctant traveler in me, solo travels always held a peculiar allure. I don't know why but I've always loved being alone during a journey, alone not lonely, mind you. Unearthing every moment of the journey. Discovering a new city or town. Observing the world around me. Reading without having to converse with a fellow traveler. Meeting new people, even if for a few transient moments, and guessing their stories. 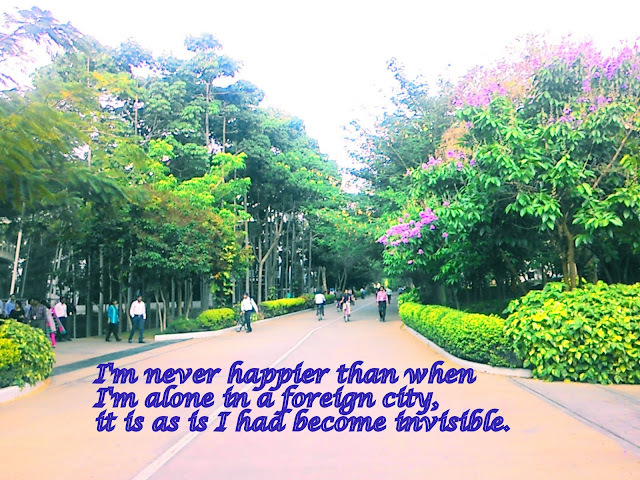 Every time I had to go somewhere alone, a part of me felt excited. Even the mundane activities of getting the boarding pass, security check or immigration formalities held a different meaning when traveling alone. I guess, from a very early age, doing those things myself gave me a sense of independence that was intoxicating to say the least. During my college going years, I loved when there was no one accompanying me on train journeys to and from home. Again, the same feeling of exploring, observing and learning undisturbed gave me a strange kind of high. When I traveled to Sydney, I found solace in exploring the city alone. I can't say the same for the times I went out in a group. During my short stay in Germany too, just going around Dusseldorf alone at times, for one thing or the other without S in tow, made me more observant of the city, its people and basically the intricacies of life in a different part of the world. I don't know about you but for me traveling solo is perhaps the only thing that attracts me to going any place new. It's what makes the process so much more interesting. What is it about solo travels that makes it so intoxicating? Perhaps, being alone makes you more receptive to people and places around you. You observe more than you normally do if not alone. The company of your thoughts helps you rediscover yourself, fathom those depths normally unreachable. I have found answers to many of life's questions, watching the world pass by, during solo sojourns. It is as if you are invisible, a part of the surroundings, the journey even. Maybe you tend to listen to yourself more during such journeys. Maybe everything makes more sense as the knots of doubts dissolve when fresh air strikes your face. Maybe not sharing a journey is sometimes the best way to put yourself in the hot seat and ask those really difficult questions. Maybe that is the reason I love solo journeys, don't you? Solo travels, all about discovering you.. I don't know when I can go on a solo journey again but maybe trips with little M will be something different, something I'll love even more. Before you go do tell me what do you love more - traveling solo or in a group?